A parent should never have to send their child to a childcare center they don’t trust because that’s all that fits in the budget. Sometimes life throws unexpected curveballs that prevent parents from giving their kids the life they deserve. This is why our center is known as one of the most cost-efficient daycares in Alpharetta. However, we know that sometimes these low costs are still challenging to meet. 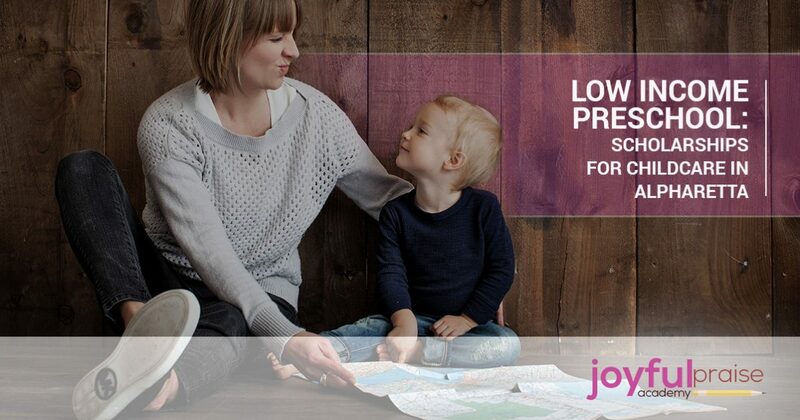 In order to prevent parents from using low-quality child care, Joyful Praise Academy offers scholarships for low-income households and teenage mothers. Please don’t wait to apply! These are awarded as needed, not at a certain time of the year. We address each application on a personal basis. We want to welcome as many children to our childcare center as possible. There are two different scholarships offered at Joyful Praise Academy. These scholarships can’t be combined with other financial assistance offers. Intended for parents who are full-time students, the Education First scholarship provides an opportunity for children to receive good care while their parents pursue a valuable education. The parent(s) with full custody must be enrolled full time in a full-time, physical school program. Parents registered at a distance school or online school are not eligible for this scholarship. High school students may not receive any subsidized childcare assistance. This scholarship is intended for parents who are working at least 25 hours a week. There are certain monetary benchmarks for household income that determine eligibility for the Alvin Trotter scholarship. If there are a total of two people in your household, you are eligible if the household net income does not exceed $24,000. If there are a total of three people in your household, you are eligible if the household net income does not exceed $26,000. If there are a total of four people in your household, you are eligible if the household net income does not exceed $28,000. If there are a total of five people in your household, you are eligible if the household net income does not exceed $30,000. Proof of income over the last 30-day period is required to apply. Then, once this scholarship or the Education First scholarship is awarded, there are certain qualifications that must be met in order to maintain the scholarship. This is intended to support the parents who truly care about giving their children the best care possible. Attendance is very important. Excessive absences from school will result in the termination of the program. Consistent schooling helps students learn more, and stability is necessary for young children. Moreover, if more than three payments are late, parents will not be eligible to renew the scholarships. We want to always provide scholarships to deserving parents. We will always do our best to offer 110 percent to our community of parents and children, but we need parents to put in their fair share too. Lastly, there are fun special activities available as extracurriculars, which may be mandatory for some scholarship programs. The Joyful Praise Academy is a local Christian preschool in Alpharetta. We strive to provide an all-inclusive program, with typical care and special activities. Our team happily cares for infants, toddlers, preschool- and school-aged kids. We can arrange transportation to and from our center to your child’s school. Learn more about our center to see if Joyful Praise Academy is the place for your family.